Both Turkey and Iran are large and important countries in the Middle East; how these two countries relate to each other is of crucial importance both for the region and for the wider world. This book explores the diplomatic, security and energy relations of these two middle power states since 1979, analysing the impact of religious, political and social transformation on their bilateral relationship. 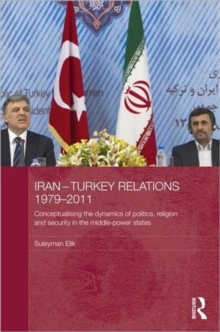 It considers the nature of Turkey-Iran relations in the context of middle power relations theory, and goes on to look at diplomatic crises that have taken place between Turkey and Iran since 1979. The author analyses Turkey and Iran's security relations with the wider Middle East, including the Kurdish-Turkish War, the Kurdish-Iranian War and the Kurdish-Arab War, and their impact on regional politics.